In a quiet part of England, very near Symonds Yat in Herefordshire and on the bank of the River Wye lie the small church and churchyard of St. Dubricius. The west side of the churchyard contains the Gwillim grave enclosure. The Gwillims, who owned the Old Court, were benefactors of St. Dubricius church. In 1744 Thomas Gwillim Senior built the family grave enclosure. Colonel Thomas Gwillim, eldest son, died before Elizabeth Posthuma Gwillim was born. Her mother died after giving birth to her, leaving her an orphan. She recorded Canadian scenery in many of her paintings. The Simcoes loved Whitchurch, Herefordshire, visiting often. As both of them had lost their mothers, Aunt Sophie, who owned The Old Court, was a much loved substitute. They are buried with some of their eleven children in their family chapel at Wolford, Devon, which has been Canadian territory since 1961. Elizabeth's grandparents and aunt shared her upbringing. Elizabeth was a remarkable woman; at nineteen she married John G. Simcoe, future first Governor of Upper Canada and founder of Toronto. During the five years in Canada she kept a diary. 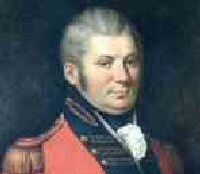 After the five years in Canada, Major General Simcoe organised the defence of South West England against the threat of invasion by Napoleon. 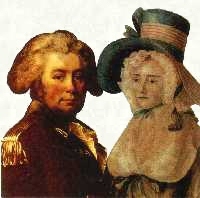 His sixth child, and first son, Francis Gwillim Simcoe, was killed at the Siege of Badajoz on the Spanish/Portugese border in 1812, aged 20.